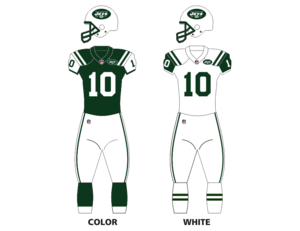 The 1999 New York Jets season was the 40th season for the team, and the 30th in the National Football League. The team tried to maintain or improve upon its 12–4 record from 1998, a season where the Jets won the AFC East and ended the season with a loss in the AFC Championship Game. Bill Parcells returned for his third year as Jets head coach, entering the year with a 21-11 record with the team. In the opening game of the season against the New England Patriots, the Jets sustained two major injuries that cast a pall on the remainder of the season. First, starting quarterback Vinny Testaverde suffered a ruptured Achilles' tendon and was lost for the year. Later in the game, starting running back and kick returner Leon Johnson tore two ligaments in his knee and like Testaverde was forced to miss the remaider of the season. Due to Testaverde's injury the Jets were forced to use three different quarterbacks during the season. Parcells initially used punter Tom Tupa, who had begun his career as a quarterback, to replace Testaverde in the opening game against the Patriots but pulled him before the end of the game in favor of Rick Mirer, a former first round draft pick from 1993 who had not played a down since 1997. Parcells acquired Mirer in a trade with the Green Bay Packers during the off season and made room for Mirer by trading Glenn Foley, a popular Jet backup, to the Seattle Seahawks. That move was roundly criticized by New York media, especially when Mirer only won one of his first five starts. Parcells finally benched Mirer after the team's seventh game; although Mirer led the Jets to a victory over the Arizona Cardinals, he only managed five touchdown passes in six starts with nine interceptions. With the team at 2–6 and entering a Monday night matchup with the 6-2 Patriots, Parcells called on his last remaining quarterback, Ray Lucas, to lead the team. Parcells reminded the Jets that a seventh loss would most likely eliminate them from playoff contention and warned his players to avoid it. The Jets won the rematch with the Patriots, which helped send them to a 6-2 finish, and followed that up with a win over the 7-3 Buffalo Bills to move their record to 4-6. However, the Jets suffered their seventh loss in their next game by losing to the eventual division champion Indianapolis Colts 13-6, and one week later were eliminated from the playoffs altogether with a loss to their in-stadium rivals, the New York Giants,.41-28, in a game that Parcells later described as one of the worst losses of his career. Despite being eliminated, the Jets continued on and won their remaining four games to finish with an even record. Two of the wins came against the Miami Dolphins, who were in the midst of a 1-5 finish to their season after starting 8-2. The Jets also beat the Dallas Cowboys, recording their final victory in Texas Stadium, and the Seattle Seahawks, who won the AFC West in 1999. Parcells announced his retirement shortly after the season concluded and announced that defensive coordinator Bill Belichick, who had been his designated successor, would take over. However, Belichick decided shortly after taking the position that he no longer wanted it and instead chose to become the head coach of the Patriots. Thus, Parcells promoted linebackers coach Al Groh to replace him while he stayed on for an additional year in the front office. 1999 was also the last season that the Jets were under the ownership of the Hess family. Owner Leon Hess died before the season began and, per his directive, the team was to be sold after his death. The process for vetting potential buyers proceeded during the entire season and shortly after it concluded, the winning buyer was revealed as Johnson & Johnson heir Woody Johnson. ↑ Parcells, Bill. "The Final Season: My Last Year As Head Coach in the NFL." Published 2000.